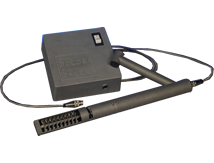 Solder-Saver offers companies ‘wave soldering’ the opportunity to rapidly recycle dross created in the wave solder pot, thereby saving up to 50% in new solder bar purchases. Aprotec manufacture a comprehensive range of Manual and Motorised stages. Many of which have been made to bespoke designs. We are an in-house design and manufacturer who have many years experience in the field of high class engineering with specialities in developing measuring instruments for a number of different hi-tech industries. Our globally renowned Z-Check SPI range, have been installed in many PCB manufacturing companies across the world where process control is paramount. If Solder Reclamation is what you require, then our Solder Saver fits the remit perfectly. The easy to use device provides a low cost quick return on investment by separating your expensive solder from the ‘Dross’ typically created by wave soldering machines. We are closely associated with the Hardness Testing Industry where we have products to suit various image analysis requirements, such as retro-fit applications including ‘Digivision’ and our new ‘Indigo System’, as a direct replacement for the ‘In 2 View system’. These products allow companies to integrate ‘old to new’ systems, thereby reducing environmental waste and carbon footprint. As a result of our developments of these products we have launched our own range of very cost effective Manual Translation stages and associated parts through to bespoke design of Motorised Translation stages for widespread applications.